Ink shading is something a lot of people look for when they are using a flex nib. Flex nibs tend to highlight shading because of the line variation – the variation in wetness and line size changes the saturation of the ink, resulting in shading. Personally, I love it. I know some people who hate it and want a solid line. If you are looking for an ink that will shade well with your flex nib, I find that lighter inks will show greater shading, and look beautiful as well. This entry was posted in Ink, Vintage Pens and tagged Flex Nib. Bookmark the permalink. Follow any comments here with the RSS feed for this post. Post a comment or leave a trackback: Trackback URL. Thank you for your article that I saw on Pinterest which led me to your article here. Personally, I love the variation that ink can have when writing with fountain pens. To me it adds so much more character. I have been collecting vintage and antique flex pens for approximately three to four years and I didn’t know that lighter colors will give you this variation. I have a ton of inks – mostly Iroshizuku and some Diamine that are medium to dark. I know that Diamine does have lighter colors available but I don’t care for the feel of their inks. I love the way Iroshizuku feels against the paper. I have recently used J. Herbin ink but they don’t feel so great and have a limited palette of colors. Do you know of any other ink companies with light colors? Thank you for your article! I like Montblanc Irish Green/Toffee Brown/Oyster Grey, Rohrer & Klingner Alt-Goldgün, Toucan Aqua/Sienna, and quite a few Diamine inks for shading qualities. 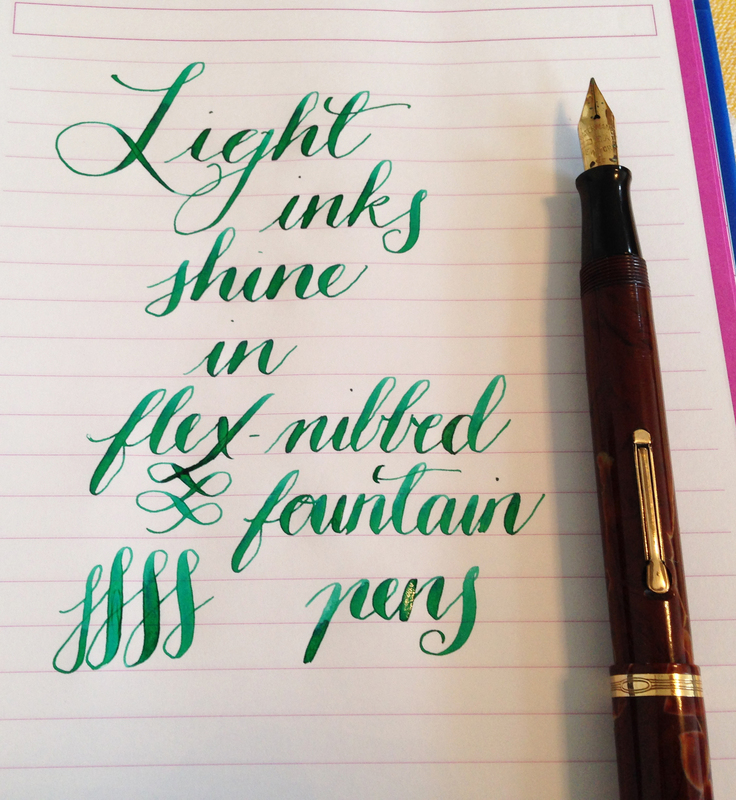 I do find J. Herbin a little unsaturated but Vert Olive and Lie de Thé are nice in a flex pen.